Union is free for up to 1000 simultaneous connections. 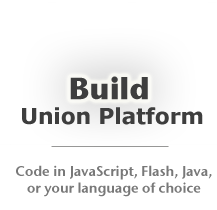 To get started building your own Union applications, follow the Union Quick Start guide. UPDATE: Union 1.1.0 has been released. WebSocket is now officially ready for production deployments. Union 1.1.0 Beta 1 includes the following changes. For a complete list of changes in Reactor, see the Reactor 1.1.0 Release Roadmap. For a complete list of changes in OrbiterMicro, see the OrbiterMicro 1.1.0 Release Roadmap. Bug fix: DatasourceException thrown by Union Datasource is reported as an "uncaught exception"
For a complete list of changes in Union Server, see the Union Server Release Roadmap. Union Server 1.0.3 fixes a persistent attribute issue that was causing superfluous attributes to be sent to clients under certain circumstances. This is a bug-fix-only server release that does not require any updates to Reactor, OrbiterMicro, or other client code. Union 1.0.2 is now available for download. This release introduces OrbiterMicroNode, a Node.JS framework for creating Union load testers, automated clients, and two-way communication bridges between Node.JS and Union. Union 1.0.2 also adds a Modules tab to Union Admin, and includes a variety of minor improvements and bug fixes. For more information about this release, please see the Union 1.0.2 Release Notes. The release includes a chat bot example and a load test example. Union Server 1.0.1 fixes a connectivity issue that prevented clients from communicating over HTTP in some server configurations. This is a bug-fix-only server release that does not require any updates to Reactor, OrbiterMicro, or other client code. Today Influxis announced that it will soon begin offering a wide range of Union hosting services, ranging from entry-level plans with affordable pricing to high-traffic plans for large-scale deployments, complete with technical support and project management. Developers who want to start hosting with Influxis right away can already sign up for an early adopter program. For complete details, see union.influxis.com. Influxis is the world leader in Adobe ® Flash® Media Server hosting, and is widely known for its expert interactive media delivery, massive scalability, reliability, and superior customer support. It's official! Union 1.0 is now shipping! The final release includes a small but important group of bug fixes, and some final polish. With Union 1.0's official release, the Union Platform is now ready for production use in real-world deployments. We've also announced product pricing, and introduced a licence key system for projects requiring more than 1000 simultaneous client connections on a top-level domain or at a private site. We'd like to sincerely thank the Union user community for helping to evolve and nurture the platform. We're super excited to see the incredible collaborative interactions you come up with. We're in this together, so drop by the forums and let us know what you're building and where you'd like to see Union go next. We'd also like to thank MegaPhone Labs, who have provided deep support for the Union Platform for the past three years. For more information about this release, please see the Union 1.0 Release Notes. Union 1.0 Beta 2 also completes Union's banning and moderation features, dramatically improves Reactor's core performance, polishes HTTP communications, expands Union Admin's capabilities, and includes a long list of final API tweaks and bug fixes. For more information about this release, please see the Union 1.0 Beta 2 Release Notes. Union 1.0 Beta 1 is now available for download. Beta 1's primary focus is Union Server security. Prior to Beta 1, malicious clients could easily attack Union Server using built-in commands such as "remove room" and "remove account". For example, a client could request a list of rooms on the server and remove them all without restriction. As of Beta 1, Union Server provides fine-grained controls over client privileges. An administrator can, for example, specify that a room can be removed by the client that created it only, or that no client is allowed to remove any room. For complete details, see Union Server's security settings documentation. Now that security is in place, Union 1.0's feature set is largely complete, very few bugs remain, and the API is close to frozen. 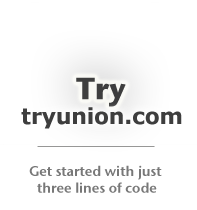 We expect to release only one more Beta version before shipping the final Union 1.0 commercial release. For more information about this release, please see the Union 1.0 Beta 1 Release Notes.